How Possum Got His Skinny Tail. You know now how Possum have thin tail like snake, no hair. Hang from tree. I tell you story of Possum and tail. So, all animals go to Council. And Possum walk in and take honoured seat next to Bear. Bear look, “Humph.” Bear open Council, and Possum spring to his feet as Rabbit push him from behind and say, “Speak now, Possum.” And Possum stands in middle of circle and says to all animals, “I am honoured animal at this Council. I have been chosen ’cause I have most beautiful tail. You all know I have most beautiful tail. I will show you now how much more beautiful my tail has become.” And Rabbit wink at Possum. And Possum in great display unwraps snake-skin from tail. And as he unwraps snake-skin all fur come off tail with snake-skin. Tail naked, no fur. Thin like snake, no fur at all. Rabbit chuckle in corner, and Possum so embarrassed that he pretend to be dead. And all animals laugh. And Council break up in laughter. 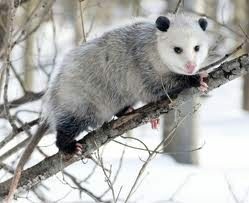 To this day Possum have no fur on tail, thin like snake. Rabbit trick him. Why Rabbit trick him? (Blue Sky: “Because he was too proud of himself”) And conceited. When I praise, say “I am proud of my children”, when I say, “Good pipe”, when I say, “You do well”, it is so. It is not so that you say, “I am better than other animals”. It is so. Remember lesson, you make me proud. Posted in Native American Legends & StoriesTagged Animal, Snake, Common Brushtail Possum, Possum, Opossum, Tasmanian pygmy possumcommentLeave a Comment on How Possum Got His Skinny Tail.